Beautiful and unique photos are loved by everyone. And if they have some story to tell they just touch our minds and make our day. But sometimes it becomes difficult to tell a story with still photos. What if we get an option to animate these still photos to help us narrate the story and give these still art a life. Introducing PhotoMirage by Corel – one of the unique range of product that helps you to create good quality animated videos or motion picture in just a few and easy steps. PhotoMirage helps you to create mesmerizing photo animations in just a few minutes. 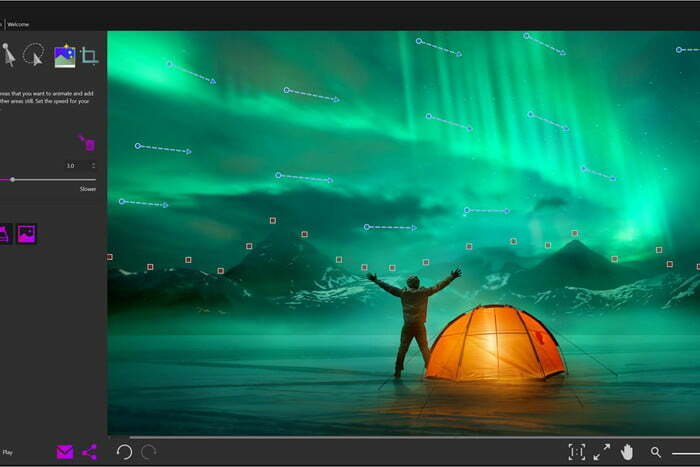 Animate:- Drag and Drop motion arrows over the parts of the image you want to move. Isolate:- Plot Anchor points around the areas you want to keep still. Preview:- Hit Play to watch your image transform into a looping animation and then save it or share. Boost your social media engagement by creating some awesome animations with just a picture and share it with your friends on all social media platforms. Viewers will definitely love the motion pictures and would be eager to know the magic behind it. Moving images have viral appeal, they are like an illusion not quite a photo & not quite a video. Hence, Corel might have named it as PhotoMirage !! Break through the clutter with these beautiful photo animations which convey emotions better and are more effective than the images. And doing all these things with PhotoMirage is not that difficult, you only need to follow the above 3 steps and there you are with a great animation picture. Also, Corel has listed a few tutorials on their website which will help you to master this art perfectly. And there is a gallery section too on their website where you can upload your art masterpiece with PhotoMirage. Easy to use animation tools that help in generating mind-blowing results. Create professional looking photo animations in just a few minutes. Animate, Isolate, Crop, Preview, and Refine are some of the highlight features of it. Share awesome contents on Social Media or Web easily right from the software. An easy way to start and learn professional skills to edit motion pictures. Start with JPEG, PNG, RAW, BMP or TIFF photo and end up with a WMV, MP4 or GIF. So, Getting started with PhotoMirage is easy and becoming an expert too. Move your images from Static to Stunning with just a few steps. No skills required and no need to start with a video file, just an image necessary. If are a photographer or any creator who love to create quality motion pictures or videos, PhotoMirage is a great tool for you and must try it and unleash the creator in you !! Corel PhotoMirage is a Windows-only software and available for Windows 10, Windows 8 or 8.1 and Windows 7. It is available for a trial period of 15 days after which you can purchase this product for $69.99 on Corel PhotoMirage official website. Move your images from Static to Stunning !! !